When I last talked about my trip to Moravia, I didn’t actually give you many details about the fishing itself. Truth be told, I almost came home with nothing to recount at all. I had booked a full-day trip with Fisherman John, with the optimistic objective of targeting pike in the morning, and lake trout in the afternoon. Or maybe it was the contrary. I don’t quite remember — a sign that things didn’t go exactly as planned. Fishing reports were good, as was the weather (although one can always blame the weather when fish are not cooperating), and John’s been fishing Owasco Lake for more years than he can count. We tried all the good spots on the lake. We looked hard, with both our polarized glasses and our sonar. We worked hard, trying different lures, different colors, different speeds. And yet, after 6 hours or so of casting, all we’d seen was one pike that looked at my lure and swam away. 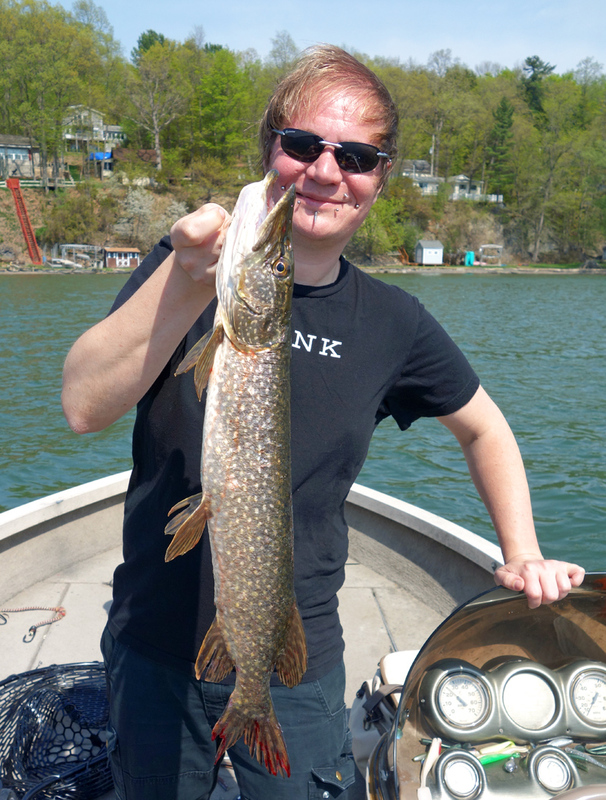 Until finally… Pike didn’t exactly start jostling to bite my lure, but I got one: a respectable specimen. As for the lake trout from my last post? It was caught two hours later, literally the very last time I dropped my line before going home! All of a sudden, this became a successful trip, with enough fish to feed my little family for a few meals. Even though pike is found in fresh water throughout the Northern Hemisphere, you don’t see a lot of pike recipes in cookbooks. Most of my Czech and Hungarian books prefer using pike-perch, which is not pike at all, but a cousin of the walleye. George Lang’s Cuisine of Hungary has a few recipes: poached pike in horseradish cream (an 18th century recipe), poached pike in walnut sauce, and baked pike in sauerkraut (presented with the fish head holding the liver in its mouth). In fact, the only pike I’ve ever eaten before was in French quenelles, often served au gratin with a Nantua sauce, and I could count the number of times I tried these on the fingers of one hand. 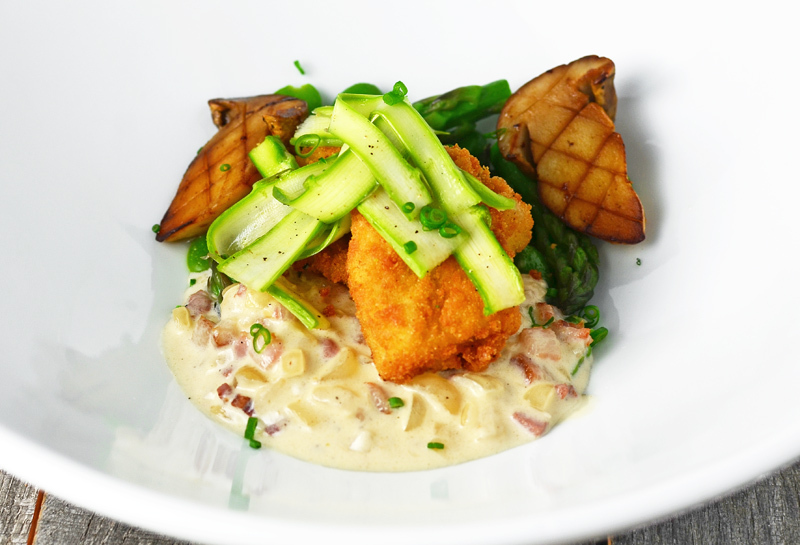 But then, while re-reading the Fall 2012 issue of Culinaire Saisonnier, I came across a recipe for trout goujonnettes with bacon sauce, created by Thierry Baldinger, chef at Le Faudé in Alsace. This made me think of two things. One, the cuisine of Alsace shares a lot of products with the cooking of Central Europe: the freshwater fish inherent to a landlocked region; the sauerkraut; the bacon, sausages and other cured meats; even the foie gras. Most of the recipes from Alsatian cookbooks could probably pass for Czech, with enough explanations! Second, pike would work very well in goujonnettes. Although there are a lot of bones and they’re often hard to remove, the flesh has a nice texture, and it’s a fish that’s neither fatty nor terribly flavorful, so the bacon sauce helps. So I yoinked the bacon sauce from Baldinger’s recipe, substituted trout with pike, and added a tasty mix of spring vegetables that grow equally well on a farm in [Czech] Moravia or in California. In a small saucepan over medium heat, sauté the onions in the butter for a couple minutes. Add the bacon, and cook until golden brown. Add the vinegar, simmer for a minute, then add the heavy cream, and season with black pepper. Bring to a boil, and remove from heat. Reserve. Blanch the asparagus tips in a pot of salted boiling water, then transfer to a bowl of ice water, and let cool. Blanch the fava beans in a pot of salted boiling water (you can reuse the asparagus water), then transfer to a bowl of ice water, and let cool. Peel the beans — you should get about 100 g peeled fava beans. Season the porcini with salt and pepper, and sauté in a pan over medium heat with the butter until golden brown. Using a vegetable peeler (or a mandolin), cut the asparagus stalks into thin shavings. Transfer to a bowl, and then toss with the olive oil, salt, and pepper. Reserve. 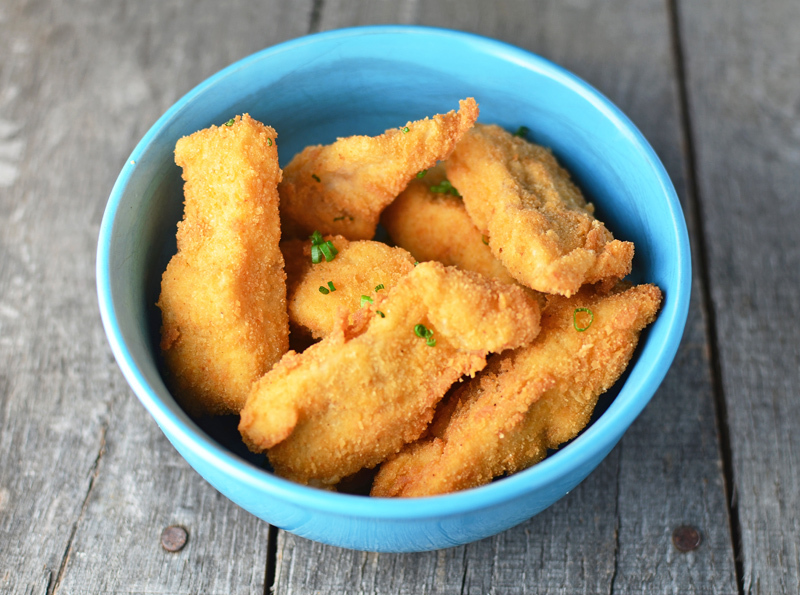 Fill a deep-fryer (or a pot) with canola oil, and bring to 175 C / 350 F.
Prepare three bowls with the flour, beaten eggs seasoned with salt and pepper, and breadcrumbs, respectively. Make sure all of the bones from the pike fillets have been removed. Cut into 8 pieces, and season with salt and pepper. One piece at a time, dredge in flour, coat with the egg mixture, and toss in the breadcrumbs. Deep-fry the pike until golden brown on all sides, then drain on paper towels. Proceed with assembly immediately. Reheat the bacon sauce in a small saucepan. Reheat the spring vegetables in a small saucepan with the butter, and rectify the seasoning if needed. In each bowl, make a small mound of spring vegetables, and ladle some bacon sauce next to it. 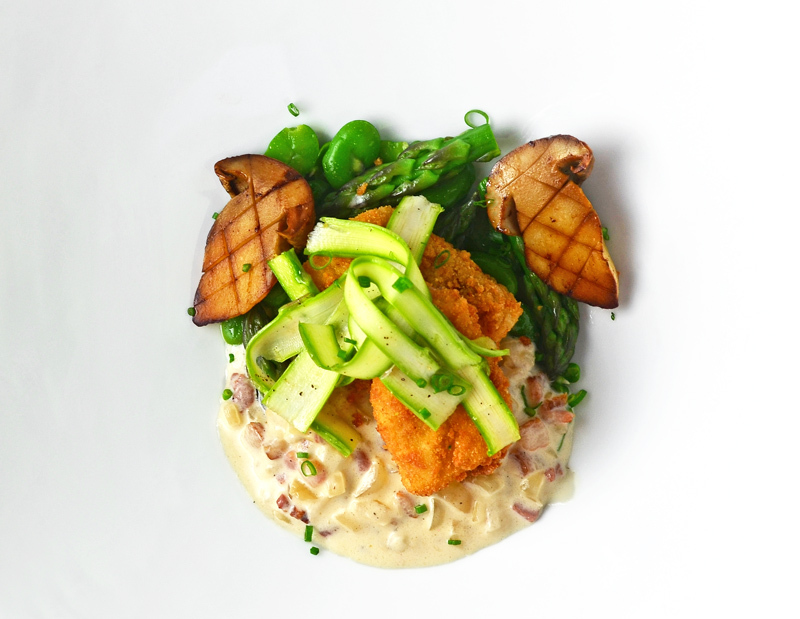 Place two pike goujonnettes in the center, top with some of the asparagus salad, and sprinkle with chives. Serve immediately.